After the funeral service has finished then the jazz band strikes up with more happy songs for one reason, to celebrate a life well lived. Where do we come in? Well, we have been supplying a jazz band for a funeral with our New Orleans Funeral Jazz Band for many years now. Believe it or not most peoples perception of the jazz funeral comes from the 1970’s James Bond Film “Live and Let Die”. The opening scene is of a jazz funeral, set in New Orleans and featuring a New Orleans Jazz Band playing “Just a Closer Walk With Thee”. 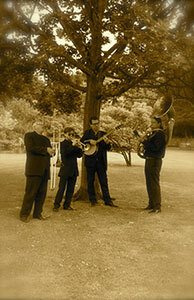 We are able to supply a jazz funeral band in London, the South East and most parts of England. We are able to do this at a sensible price, even far from London. How? Because we have excellent relationships with talented local musicians around the country. We combine our London professionals with local players, therefore keeping costs at a sensible level. Usually we recommend between four and six players. Below you can experience the band play an example of a slow hymn, sometimes known as “The Dirge” followed by some more uplifting happy music. A typical jazz funeral may unfold like this: The band convene at the cemetery gates. When the funeral cortege arrives the New Orleans Jazz Band walk everyone up towards and in to the chapel. After the service is over those attending come out of the chapel and the band start playing happy songs like “When You’re Smiling” “Ain’t Misbehaving'” and “After You’ve Gone”. As the cortege gets back into the cars, the jazz band make their way to the hotel or restaurant for where the wake is to take place. The band continue with upbeat songs for an hour whilst people mingle, hopefully sharing stories of the person who has passed away. 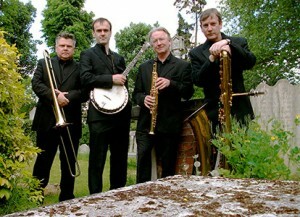 Variations on the funeral bands service include starting from the house of the deceased. Maybe you want the band to play reflective music during the service. Are you arranging a West Indian Funeral and you want the band to play hymns for singing by the graveside? We always try and oblige individuals wishes. For a great jazz band funeral procession, you can do no better. What happens now? You can contact us here for a quote or phone us on 020 8761 8932 to discuss the individual requirements of the funeral you are arranging. If it helps, we are more than willing to liaise with your funeral director on timings and payment etc. We can send over testimonials from people who have used our services. In the meantime, here is one of many genuine testimonials from a client who arranged his brothers funeral recently. ”The New Orleans Funeral Jazz Band gave my brother the best send off ever imagined at his funeral celebration yesterday. Jeff’s Band arrived well before time. They then met immediate family and played before, during and after the service. We went for an upbeat celebration which the Band achieved to perfection. The whole gathering were saying it was the best funeral ever. They loved the style and the manner in which Jeff and his Band conducted themselves. If you have ever fancied a real ‘send off’ which will not upset the older generation, and will take the pain out of a funeral, then go for Jeff and his Band.